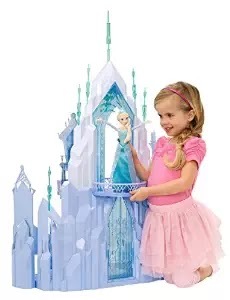 Today (11/22) only, while supplies last, get this Disney Frozen Elsa’s Ice Palace Playset for ONLY $77.99 Shipped (Retail $129.99)! -Share the magic of Elsa’s ice castle from the Disney movie Frozen! -Transformational features allow girls to channel Elsa’s icy powers! -Create a magical light show, turn snow to stairs, send an icicle chandelier spiraling downward, and make the castle “grow”!